I love that people love this prologue — and it might surprise you to know that the very first thing you read in the book is actually one of the very last things I wrote for it. I wrote the current prologue so late in the process, in fact, that if you were one of those readers who received an Advance Review Copy (ARC), you actually got a book that had a different prologue in it. Oz used the term “affectionate anarchy,” and I loved the phrase so much–it’s such a perfect way to sum up the Muppet mentality–that I put it at the top of the opening chapter. And that was how the ARCs went out in early 2013 — with a prologue about the Muppet pipes called “Affectionate Anarchy.” And it stayed that way for quite a while. That actually sounded fine to me. Two years earlier, even before I had written a single word of Jim Henson, I had always pictured his biography opening with him working on the labor-intensive opening scene of The Muppet Movie, sinking himself in a makeshift bathysphere to perform Kermit from underwater. I had even tried writing just such an opening, but hadn’t been happy with the first few drafts. This seemed like a good opportunity to go back and work on it again. I wrote and rewrote for a week, but after several more drafts, it still wasn’t coming together. It was too big and ambitious and technical; I needed something warmer and more intimate. So I decided to start over, looking down my list of Muppet moments, and decided to expand on one that I particularly loved–the ABC Cookie Monster bit–which took up only about a page in the ARC. The chapter’s title actually came right away, courtesy of a story told to me by Sesame Street performer Fran Brill who, during one of our phone interviews, told me of director Jon Stone and others calling out “blue sky!” when a child was on the set, reminding staff to watch their mouths. I loved that; it was such a warm image for Sesame Street — after all, wouldn’t one of Sesame Street‘s famous “sunny days” have a blue sky?–and it seemed a perfect way to begin. I wrote the prologue over two days—a slow pace to be sure. I sent it off to Ryan, who smartly excised one line near the end, then sent me one of his typically concise e-mails: “This is perfect.” I don’t know about that, but I do like it. One last thing: with the new prologue in place, I now had to find a new photo to use at the top of the chapter. In the original ARC, I had planned on using a photo of the Muppet pipes — probably something like the photo at right — but with the new prologue, I would have to look for something new. There were no photos of Jim performing the ABC sketch with Joey; about the best I could do was a screen grab. Without that, then, what I really wanted was a photo of Jim getting ready to perform—preparing to bring a character to life simply by putting it on the end of his arm, which is one of the themes of the prologue. Initially, I wanted to go with the photo at the left — it’s Jim with Kermit draped across his lap, miked up and waiting to perform, probably not on Sesame Street, but it makes the point. When it came time to clear the image, however, Disney wouldn’t allow its use, informing me that they didn’t permit photos of “dead” Muppets. I argued that that was precisely my point — that Kermit is dead until Jim puts him on–but despite the help of a sympathetic archivist at The Walt Disney Company, I had to scuttle this particular image and look for another. 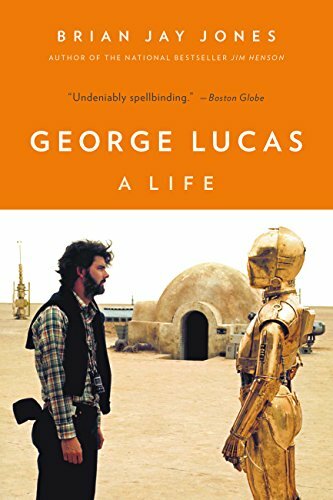 If you’ve got the book, you can see the image I eventually chose (you actually don’t have to look much further than the top of this blog, where you’ll see Jim squatting with Kermit on his arm). So there you have it. 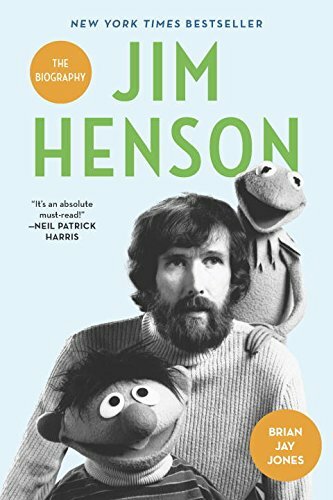 If you’re one of those readers who has an ARC of Jim Henson: The Biography, and are wondering if there’s anything significantly different between the ARC and the final product, you’ll find it in the first few pages. Well sure. After the constant scheduling and rescheduling of the Today show, I wasn’t going to get my hopes up and get stung again (though I should add that the Today show will, indeed, now happen). But there was another problem, too: the date The Daily Show was setting aside was Thursday, October 10 — the same day I was scheduled to appear at the New York Society Library. That event was scheduled to get underway at 7 p.m. — and if things went as planned, I wouldn’t be getting out of The Daily Show until that same time. We went to the NYSL, hat in hand, to see if we could get the start time pushed back even 30 minutes, though the mechanics of getting me across town at that time of night were going to mean cutting things very, very close. Unfortunately, none of us could figure out how to get it to work, and Mark Bartlett and his staff at the NYSL were incredibly generous — and very understanding — and graciously offered to reschedule the NYSL event for another time. On October 1, then, came the word we (meaning me and David and the publicity team at Random House) were waiting for: I had been officially confirmed. The seventy-five minutes between 5:45 and 7:00 p.m. were blocked off on my schedule on Thursday, October 10. And while it was still nine days away, that was nine days I had to be an anxious mess. And man, was I nervous. On the afternoon of the 10th, then — a somewhat cool and overcast Thursday — my wife (Barb, thank goodness, came along as moral support) and I sat in the lobby of our New York hotel, while I nursed a beer and nervously bounced my knee up and down. The Daily Show takes good care of you from moment one, and a car came by the hotel to pick us up and whisk us away to their studios—one of those experiences where you’re excited at the idea of riding in an Actual Private Car — with a driver barking his estimated arrival time into a walkie talkie the entire way — but still vaguely embarassed that someone is holding a door open for you. We were brought up to the back door — a blank door in a blank wall with no sign whatsoever of what was behind it — and met by Hillary, the producer for my segment, who escorted us down a little jog of a hall to an open door with a sign next to it that read BRIAN JAY JONES. Nice. Next to the sign was the Green Room — which is actually not green at all, but rather a cozy, living room-like space with stuffed chairs and a comfy sofa where guests wait until needed — and here I was met by my editor Ryan Doherty, and the ever-patient, ever-present David Moench. Barb and I sank onto the couch in front of a large, hi-def television on which The Daily Show logo was visible. I bounced my knee again as I sat down, though a bit slower now, and we all chatted about what a surreal experience this was until I was taken away for a bit to go to makeup (mostly to reduce the glare off my bald head) and fitted with a remote microphone. And suddenly, poking his head into the Green Room, was Jon Stewart. My wife — a big fan — pointed and gasped. “No WAY!” she finally said, and Stewart laughed that quick high-pitched giggle of his and said, “YES WAY!” We all shook hands and he stood with his arms folded as we chatted briefly for a few minutes — he was particularly fascinated by Jim’s memorial service, which he had recently viewed on YouTube. Then he disappeared to get to work. We all watched the show on the hi-def TV in the Green Room. There was no noise, no sounds, no indication that a TV show was being taped anywhere in the building; we could almost have been sitting in our own living room. Suddenly, I heard Jon Stewart — Jon freaking Stewart! — saying my name, Hillary said, ‘Go!’ and out I went. The music played, the audience applauded, and I didn’t miss the step. Then I shook Jon Stewart’s hand and sat down. And just like that, I was on The Daily Show. No rehearsals, no walk-throughs; it’s a finely-tuned, well-oiled machine, and you’re doing it in real time, one take. Wow. It took me just a split second to get going — the best advice Hillary had given me in our pre-interview conversation was, “Don’t be afraid to talk, and don’t worry about stepping on Jon while he’s talking. He loves guests who talk.” — and it took me just a moment to realize why Stewart is a great interviewer: he doesn’t really ask questions. Instead, he throws out comments or a bit of a conversation starter, and then lets you take things where you will. Somehow, once we started talking, I wasn’t nervous — and it was over almost before I knew it. And have you seen that moment just after the interview where Stewart puts his head down near the desk and he and the guest have a brief bit of a conversation? It’s actually a very clever way of ensuring the guest doesn’t start to bail out of their seat before the camera cuts away. Instead, Jon Stewart leans in and stage whispers, “That was great, thanks so much — you did a great job” –and you lean in to listen, straining to hear, which keeps you in the chair until the fade out. Very smart. After shaking his hand again, I stood up, and was steered back to the Green Room by Hillary, where we all watched the final piece, a nod to a departing long-time producer. Then we all said our goodbyes, and went back to the waiting car to be whisked away again. All told, it took about 75 minutes, just as promised. They’re really, really good at this, and I had a really, really good time. And now, here I am on The Daily Show with Jon Stewart — a once-in-a-lifetime moment that I’ll never forget. 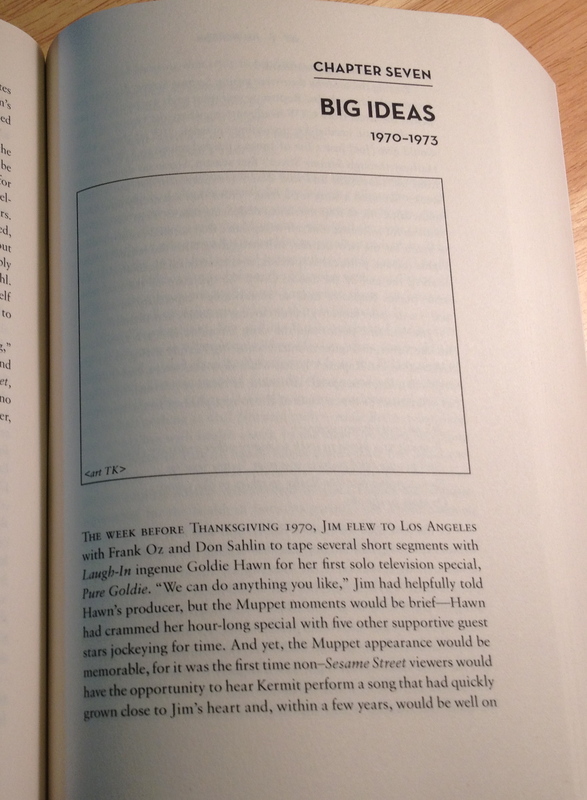 See that big blank square at the top of the chapter in this advance copy? Yeah, a photo goes there. Several readers of advance copies of Jim Henson have asked why the book doesn’t have any photos in it. Good question. The ARCs for Jim Henson didn’t include photos because (1) typically, advance copies of books don’t include the photo inserts, and (2) in the case of Jim Henson, it took a long time to clear some of the photos, so we couldn’t have included an insert even if we’d wanted to. In fact, the last of the photos didn’t clear until about three weeks ago, which is actually cutting it pretty close. It was genuinely tough deciding which photos to use. I spent weeks sitting with, talking with, and e-mailing archivists, scrolling through digital files, turning over page after page in black photo binders, and squinting through an eyepiece at tiny photos on contact sheets. There were just too many great photos to count, and in my first pass, I selected more than a hundred I wanted to use. From there, my editor Ryan Doherty and I set to work paring them down. With space limited, we wanted to get the most from any picture we might select–and if there were several people in one photo, all the better. Jim directing David Bowie and Jennifer Connolly in Labyrinth? Perfect. Jim performing with Kathy Mullen in The Dark Crystal? You bet. Jim standing by himself in the middle of a sound stage during the making of The Dark Crystal? 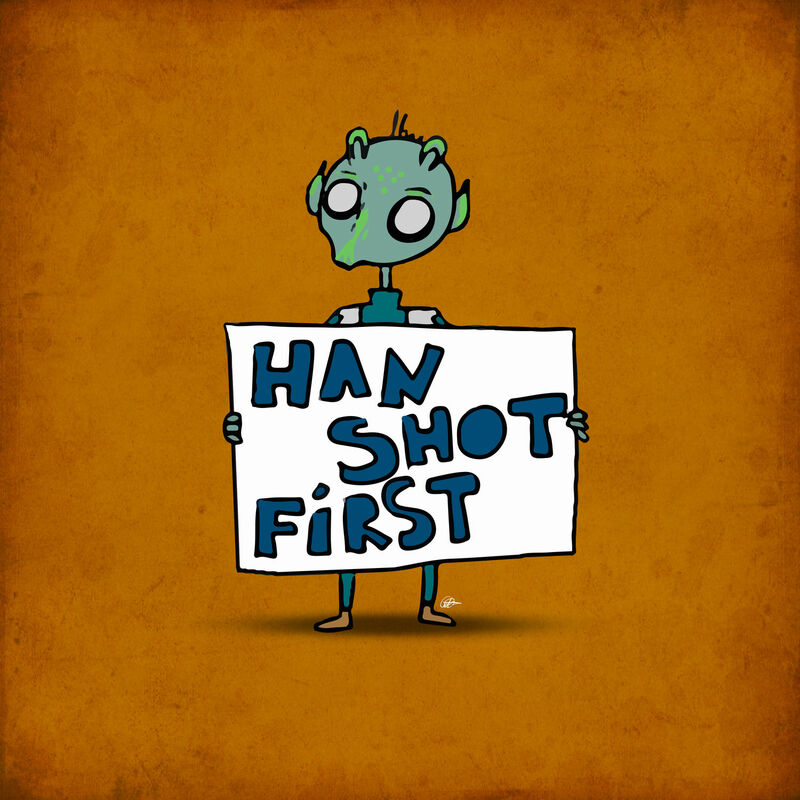 Alas, not so much — but a tough call. 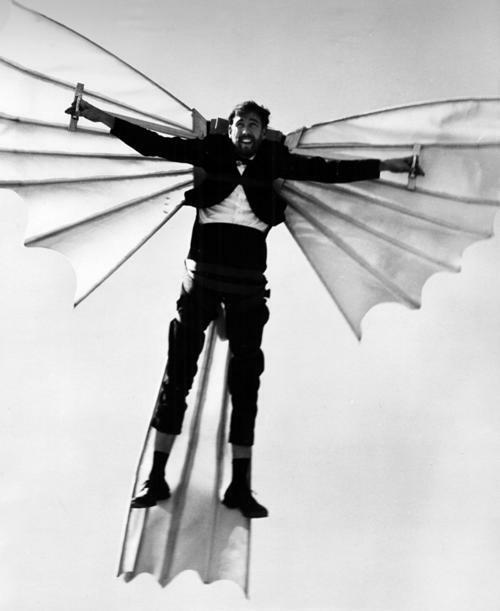 Jim Henson soars in 1965’s Time Piece. A no-brainer. Some photos, of course, have been seen and used before–but they’re just so good, so iconic, it’s impossible not to use them. The photo still of Jim soaring on his DaVinci wings from Time Piece, for example, is a no-brainer, as is the 1960s-era photo of Jim and nineteen-year-old Frank Oz with Rowlf the Dog. There’s a reason these photos have been used before, and will probably be used again and again: they’re great. Still, sometimes we ran into problems. There were a few photos, for example, where it was unclear exactly who owned them and how they might be legally cleared for use. Other times, there were photos I loved and wanted to use, but their owner wouldn’t clear them. Those things happen, but it likely means that someone’s favorite photo is bound to be missing. Ultimately, we tried to pick photos that were not only visually interesting, but by merely flipping though the photo insert, you could get a fairly good idea of the arc of Jim’s life. I’m thrilled with the photos we’re using in this book–and while it wasn’t always easy, I appreciate that we were permitted to use each and every one of them. * Meanwhile, if you’re looking for books with lots of color photos, you couldn’t do much better than Christopher Finch’s classic Jim Henson: The Works or Karen Falk’s magnificent Imagination Illustrated: The Jim Henson Journal . If you’re a Muppet fan, you’ve already got both of them. Literary Detectives? Or Just Plain Nosy? Over at the Washington Independent Review of Books, my colleague Charles J. Shields discusses the art and craft of research in biography—from rooting through personal belongings and private letters and papers, to rummaging through newspapers and digital archives. Has the rise of the internet and online sources made it easier to research a life? Or has it merely made for more “I Wake Up Screaming” moments? Charles discusses it all with his usual good humor (and a really great headline), and picks the brains of other biographers—including, I must humbly admit, yours truly. But don’t let that stop you from reading it. Go get it — and there’s more to come, so stay tuned. Last winter, when I junked my old and slow Dell desktop in favor of a MacBook laptop, I had to switch my home banking program to a new software. I had been running Microsoft Money for years, and was generally happy with it. I don’t need anything fancy in the home finances department — I don’t invest in the stock market or track my retirement or anything like that — so my requirements are fairly simple: I want it to look like a checkbook, and I want to be able to print out reports at the end of the year. When I changed operating systems, then, I was hoping I could just load Money for Mac, move my data with a zip drive, and just keeping going along like nothing had changed. There was just one problem: they don’t make Microsoft Money any more. So whether I wanted to or not, I had to switch. Again, I don’t need anything fancy, so I opted to pick up the newest version of Quicken — which I had never used, but which seemed to be a fairly easy and intuitive program to work with. I went to the Intuit website and advance ordered it — this was last winter, and it wasn’t scheduled to ship until early this Spring — paying about 69 bucks for the newest version. Price reduction and $20 refund—we are dropping the price from $69.99 to $49.99 and you will receive a $20 refund! Your credit card will be credited automatically in 4-6 weeks; you don’t have to do anything. Sure enough, last week, my bank account was credited for twenty dollars and some change from Intuit. Imagine that: a company actually giving customers money back when they lower the price of their product. That was a classy move on Intuit’s part, and they’ve made me a loyal customer who will recommend their products to others. And I do.